With years of experience in the business and the best cleaning products available, our Barnet carpet cleaners are the people you should call when a glass of red wine, a plate of bolognese or some particularly muddy feet have befouled your living room carpet. Getting your carpet clean is one of the easiest things in the world with the help of our carpet cleaners in Carpet Cleaning Barnet. We supply effective stain removal, including wine stains, pet stains, coffee stains and more, using the best tools and techniques. Contact us on 020 3540 7142 for the best carpet cleaning services in London. Our upholstery cleaning service within the EN5 region is the most effective and intensive cleaning service you can possibly obtain in your hour of need. Our upholstery cleaners are more than capable of taking on the most stained upholstery and restoring it to its former glory. The sofa cleaning that Carpet Cleaning Barnet provides is highly effective if you have lounge chairs or stools needing a thorough clean, and you can count on our cleaners to have all the products they could possibly need to do the job and do it well. When you need to get your upholstery clean, we can come and visit you at your home or place of business to get the job done. The Barnet end of tenancy cleaning is often very serious business and doing it on your own can be majorly time consuming and intensive. Our skilled team of experts around the EN5 area works hard to help local tenants deal with the perils of end of tenancy cleaning and we take on all the serious tasks that usually accompany thorough house or apartment clean. Moving out area often includes cleaning the bathroom thoroughly, cleaning the congealed fat and food debris out of the oven and scraping grease from oven hoods – all hard tasks which we will happily take on and do to a very high standard. All you should do is dealing us on 020 3540 7142 and reserve your appointment now. Domestic cleaning Barnet customers often have to forget about their leisure activities in order to handle unpleasant domestic cleaning tasks. Our home cleaning services are the best option because they are tailored to your requirements and designed to give you the freedom and flexibility to enjoy your free time and not be bogged down in house cleaning. Home cleaners in Carpet Cleaning Barnet have all the cleaning supplies and techniques to deal with a whole host of cleaning tasks, and can take on any individual task you need. When you want to get your home clean we are the company who will do a thorough and reliable job, leaving you enjoy your free time. Having a regular Barnet house cleaning service can take the burden off you and enable you to keep a lid on the domestic chores. Our house cleaners can come to you as often as you need to clean your home and complete the time consuming domestic chores that we all get bogged down with, including changing bed linen, ironing and washing. Our domestic cleaning can include any particular tasks you want but essentially we can to it all from kitchen cleaning to window polishing, from bathroom cleaning to scrubbing the shower tray and we’ll bring all the cleaning supplies we need to do the job. We can easily be reached on 020 3540 7142. Our Barnet commercial cleaners are well-trained in cleaning all kinds of business premises. If you want your office cleaning done by capable, reliable and efficient cleaning professionals, we have the equipment, products and skills to get your office clean. We also complete industrial cleaning and building cleaning, enabling businesses based in factories and workshops to benefit from high quality commercial cleaning whenever they need to comply with health and safety regulations, or just get their premises clean and ready for action. Contact us today to find out more or to book our fantastic office cleaners in for your company’s cleaning. 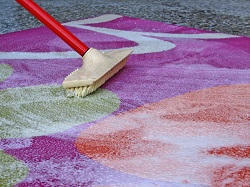 Fascinating carpet cleaning offers in Barnet are available with our professional cleaning company that serve in EN5. During the damp winter months, I noticed my curtains were getting a bit mouldy. I couldn't afford to replace them all so instead I used CarpetCleaningBarnet's curtain cleaning service which is absolutely spot on. Using all this special equipment, the team managed to remove the mould stains and now the curtains look like new again. Plus, their services are so affordable. Great value for money and a great service! I was so pleased with the results of my upholstery clean I had performed by Property Cleaning Barnet. I couldn't afford new furniture and a friend suggested that I had the upholstery cleaned professionally, so that is exactly what I did. I was impressed with the procedures that the cleaners used as it was all eco friendly. The cleaners did a careful and thorough job and the outcome was amazing. The price for the service was inexpensive and it was definitely worth the money. I would certainly recommend if you are fed up with grubby looking upholstery to hire this cleaning company. They do a great job for the money and will revive your furnishings. Barnet, Southgate, Cockfosters, Botany Bay, Enfield Chase, Finchley Central, Gordon Hill, East Barnet, New Barnet, Crews Hill, East Finchley, Potters Bar, South Mimms, Cuffley, Northaw, Clay Hill, Bulls Cross, Hadley Wood, Enfield Town, Fortis Green, Forty Hill, Hampstead Garden Suburb, Whetstone, Totteridge, Oakleigh Park, Oakwood, Arnos Grove, North Finchley, Woodside Park, Finchley, Church End, N2, EN5, N14, NW7, EN2, N20, N14, N3, EN4, EN6, N11, N12, N10 and the rest of London as well. Description: Choose our leading carpet cleaning agency in Barnet and get the best cost-effective service across EN5. Call on 020 3540 7142 now and get an extra discount! Copyright © 2013 - 2015 Carpet Cleaning Barnet. All rights reserved.